In the evolution of civilisation, the progress of the fight for national liberty of any subject nation must, perforce, keep pace with the struggle for liberty of the most subject class in that nation. The little tyrant of his fields withstood. 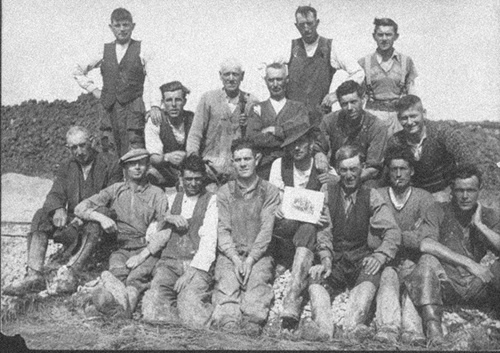 On Christmas Eve, 24 December 1933, in the West of Ireland town of Ennis, County Clare, members of the Gardai visited 26 labourers. They handed each one of them a summons to appear in Court on charges of intimidation, assault, and conspiracy, in mid-January 1934. What of communism in Ireland? James Connolly, whose whole history suggests that he would have rallied to the Russian Revolution and joined in the work of building the new Communist International, was of course dead 18 months before the Bolshevik Revolution. Jim Larkin, who would join the Communist International, was in America, and in the last part of his stay there, in jail. He would not return to Ireland until 1923. The fact that the Irish national bourgeoisie did not lead the national movement in 1916 and after did not inhibit them from from creating a thickly mythological account of Irish history as a nationalist, or ethnic-sectarian, heroic and unrelenting struggle for freedom. In power after the war of independence and the civil war, the Irish bourgeoisie cut back on the elements of a welfare state that had been developed in the old United Kingdom. A wit said of the Sinn Fein faction that had won the civil war and had taken the name Cumann na nGaedheal (clan or gathering of the Irish): “come in a gale, go in a storm”. Workers in the Free State faced a world of economic stagnation. In Clare the farmers were the new aristocracy, even though there were poor farmers in the west. The state was most responsive to their needs.